Le Bon Macaron ships macarons throughout the continental United States using Fed Ex and USPS to bring our macarons from our shoppe to your doorstep. Orders are only shipped Monday and Tuesday to avoid weekend delay. Orders must be received by 9PM EST on Sunday to ship that week. Shipments can only be delivered to a street address within the continental United States. Le Bon Macaron is not responsible for delays in delivery times due to incorrect addresses or weather delays. Shipments that are returned or require rerouting due to incorrect addresses will be subject to additional charges for reshipment. Shipping charges will not be refunded for late deliveries in the event that the package is undeliverable. All macaron orders are mailed in a cushioned, insulated package with an ice pack to ensure the integrity of our product during travel. Because of the fragile nature of macarons, some breakage of the macaron shell may occur during transport. We apologize if this unfortunately happens to you, but assure you the taste and quality of the macaron will not be affected. Upon receipt of your macarons please enjoy immediately or freeze for a future time. Macarons should be enjoyed at room temperature. Once paid in full we do not offer refunds or cancellations. We will do our best to accommodate your needs based on circumstance, however, the cancellation may not be possible. If such a need arises please email us immediately. Due to the perishable nature of our products, Le Bon Macaron does not accept returns or exchanges. If you are unsatisfied with your purchase, please contact us within one day of order arrival. For damage claims we require photographs of the shipping box as well as the damaged product. Le Bon Macaron will make every effort to make sure you are delighted with your order. 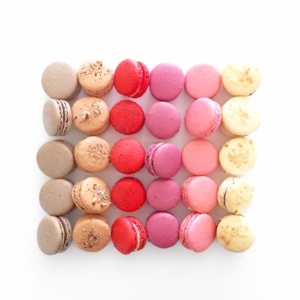 The minimum order for shipment is 15 macarons which are shipped in our gift box. One shipping box may accommodate up to 45 macarons at no additional charge. We may be reached at 616-706-0183 Monday-Friday 9am-6pm EST or via email at bonjour@lebonmacaron.com to assist you with your order or any questions that may arise. We look forward to working with you!